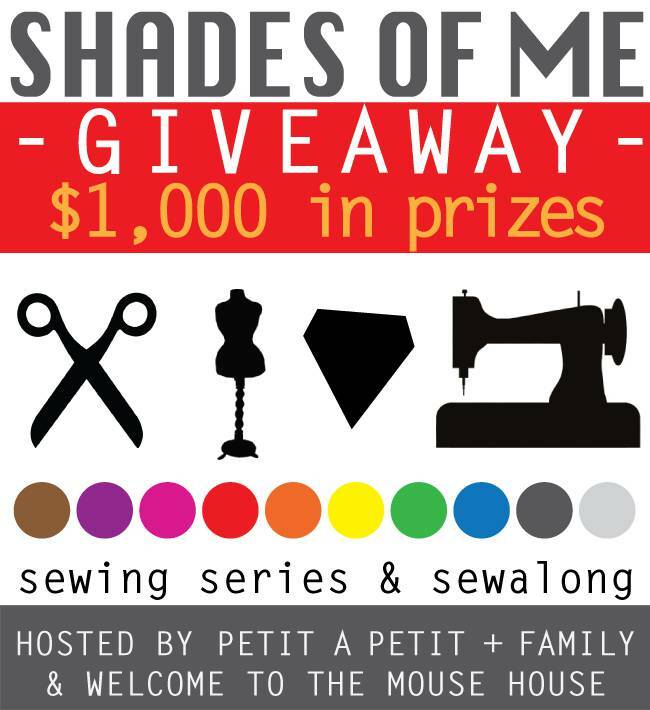 Today I am joining in with Shades of Me, a sewing series hosted by Celina from Petit a Petit and Family and Hayley from Welcome to the Mouse House, two very talented ladies who I am lucky to call friends. You can see the rest of the amazing line up below…. I was lucky to get the colour green – it’s one of my favourite colours for clothes. After my initial enthusiasm I became slightly daunted and unsure about what to make. The first thing I tried was a bodice of the Darling Ranges Dress. It’s a pattern I’ve wanted to make for a while and I already had some lovely green fabric with gold dots put aside for one. Unfortunately, there were some big fit issues and, although I will definitely make one at some point, I didn’t really have time to work out the necessary alterations. I thought about it for a while and it occurred to me that hoodies are my favourite thing to wear and since this outfit is meant to represent me this would be the perfect thing to make. 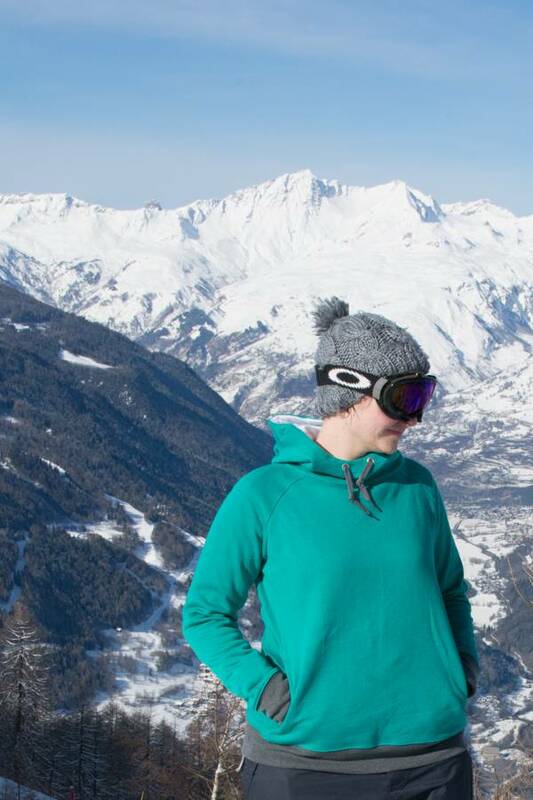 I have slightly cheated as my whole outfit isn’t green but there was no chance I was going to make my own snowboarding trousers. At least my jacket is green! I spent last week snowboarding in France so took the opportunity to get the photos while I had some beautiful surroundings. 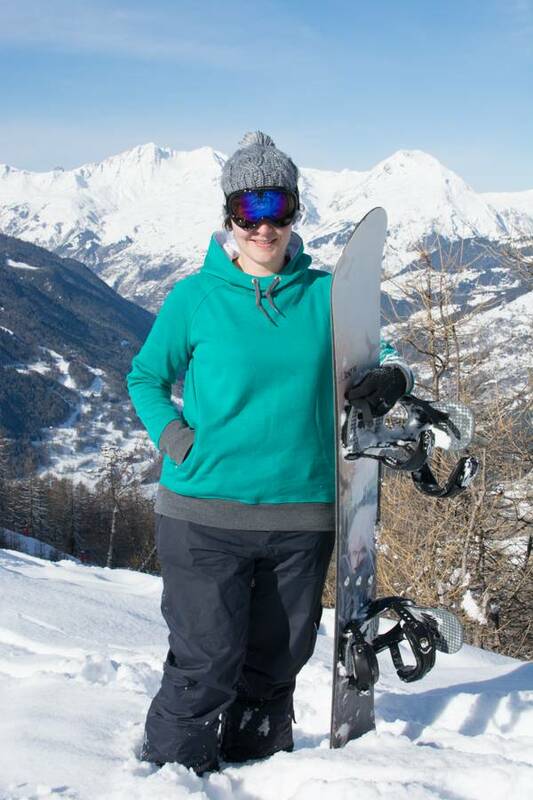 I did feel quite ridiculous posing at the side of a piste but it was worth it for the views. 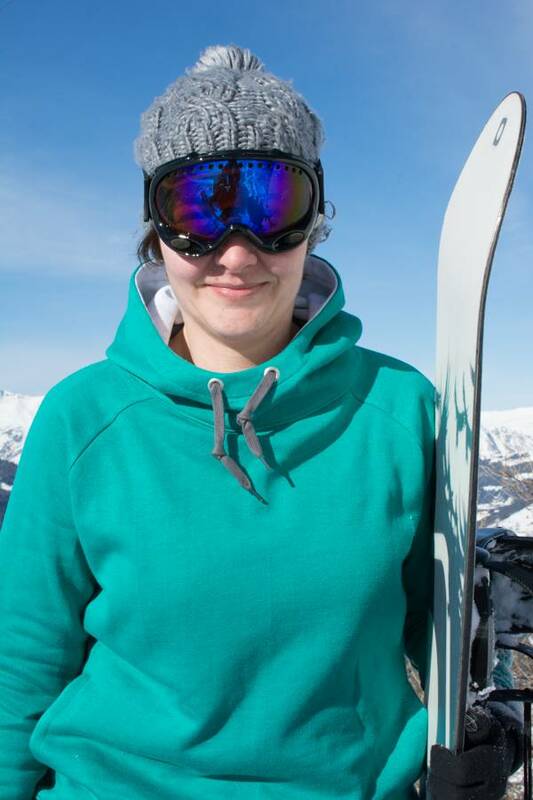 I’m afraid you’re only getting pictures of me with goggles on because the alternative was me squinting at the camera. We timed these pictures perfectly as about an hour later it clouded over and stayed that way for the rest of the holiday. The pattern is my own. 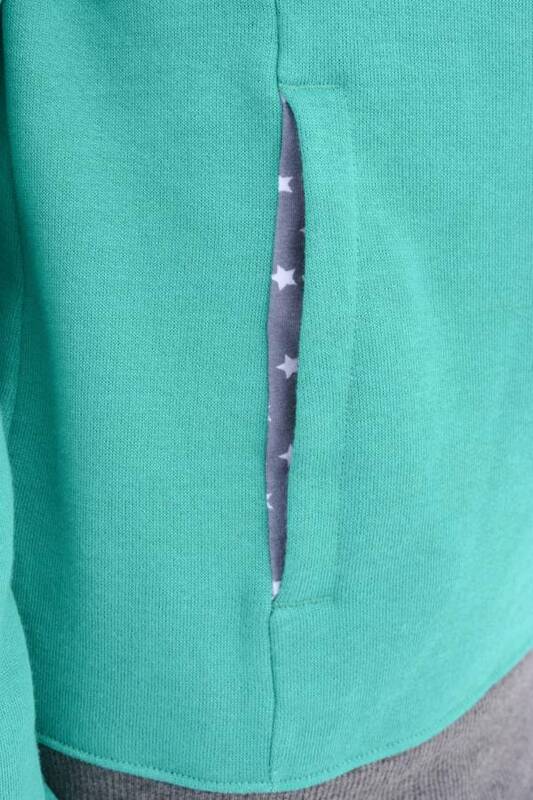 I found the jade green sweatshirt fabric on Amazon UK and already had the ribbing and pocket fabrics. This is a design I’ve had planned for a long time now so I really enjoyed making it a reality. I spent extra time adding some of my favourite details. 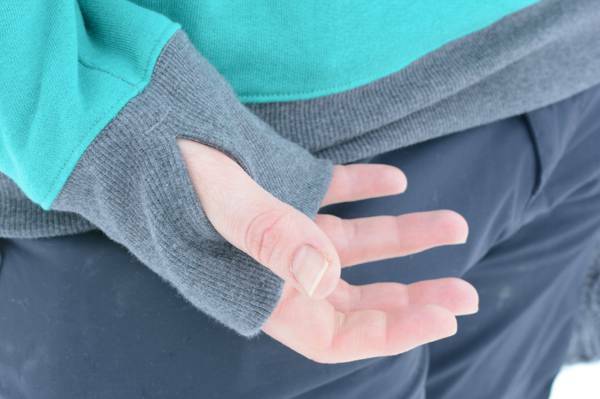 It has raglan sleeves with side panels and the cuffs have thumb holes. 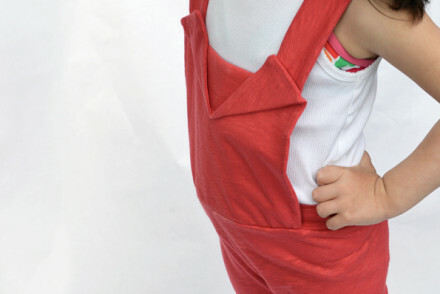 There are inseam pockets where the side panels meet the front and the pockets have French seams. The lined three part hood is so cozy. I’m going to have to make another one of these soon as I’ve been wearing this one so much. 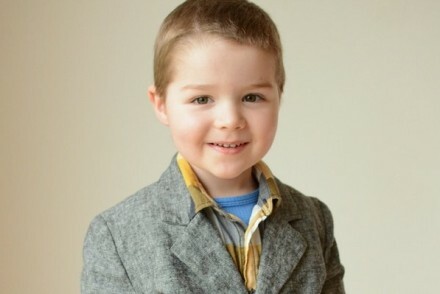 I will be releasing this pattern for women and children a bit later in the year. We had such an amazing week away and I already wish I was back there but I am very happy to have these photos as a reminder. 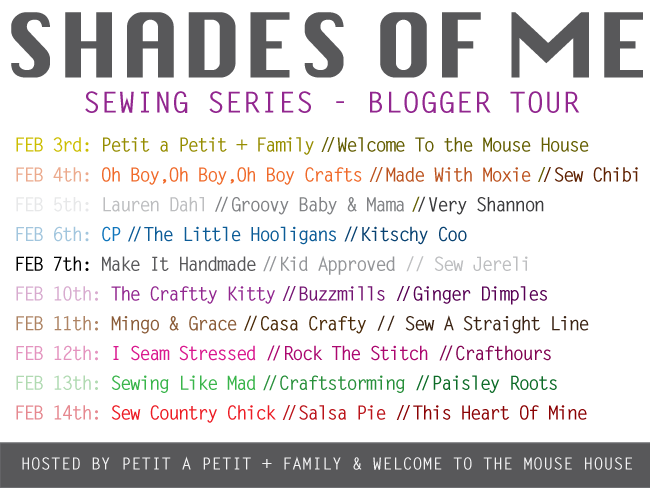 Also joining me with their own green outfits today are Mie from Sewing Like Mad and Karly from Paisley Roots. Make sure you check out their posts too! Finally, don’t forget to enter the amazing giveaway (below) that Hayley and Celina have organised! It’s worth over $1000! oh gosh those pictures are beautiful!! i love the hoodie. it is by far my most favorite thing to wear! WOW, Laura that is one perfect hoodie! 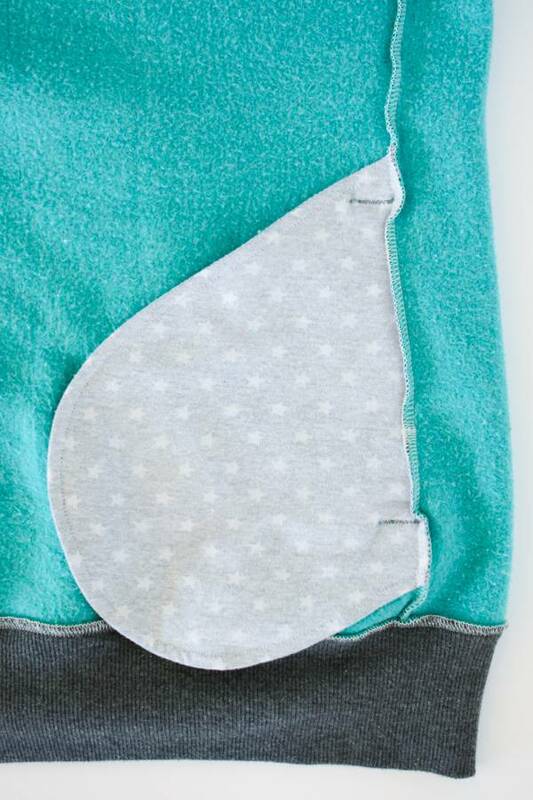 I do not know what I keep being surprised at how perfect your sewing is….it really really is…..and all those details is just adding on the the awesomeness. Unbelievable!! And I love that we both have green as one of our favorite colors! And dang! look at those mountains – beautiful!!! Loving your hoodie! The pics are beautiful too. That hoodie is awesome! I love all the little details you added and it looks so comfortable to wear! This is awesome! I can’t wait for the pattern. I will sew one for each day of the week! Wow! I need a hoodie like that 🙂 I’m looking forward to the pattern! Perfection! From the hoodie to the photos. I love that shade of green and of course all the kick as details. Amazing! You look great, goggles and all. Thank you soooooo much for being on the tour! 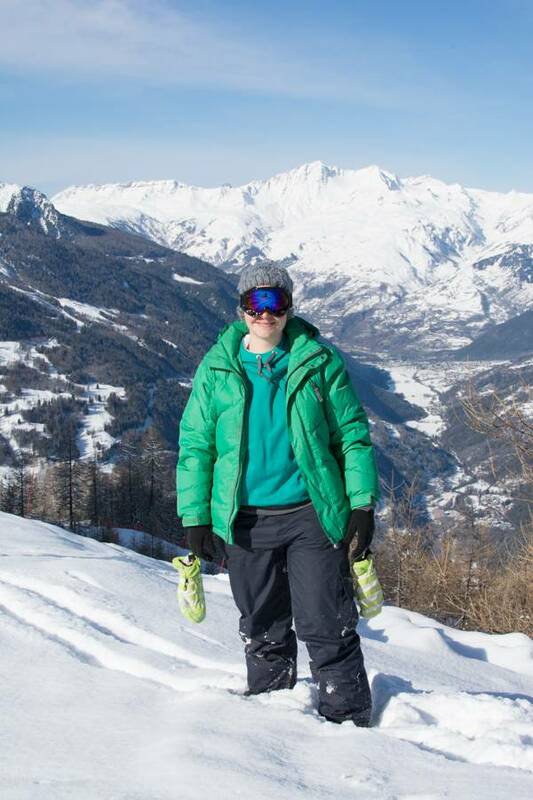 Oh Laura look at those slopes! SOOO jealous!! The hoodie looks great, and perfect for the weather. I love love seeing detail shots of your sewing, it is so neat. I especially love the pocket details, they look so professional. Cant wait for the pattern, I don’t have a favourite hoodie at the moment they are all a bit worn out. Oh I love it! The thumb slots in the cuff is perfect for active wear. I have a couple shirts with that feature and they are my fave. And that is the most beautiful backdrop ever! You look so great! 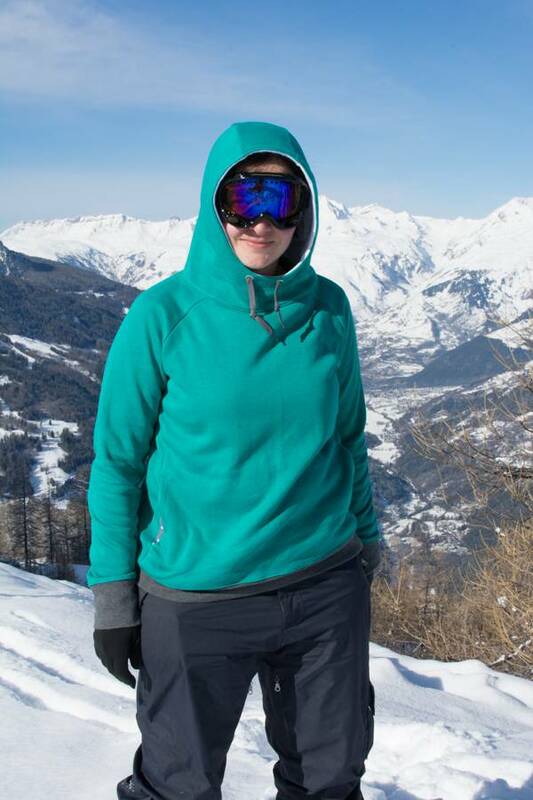 The snow and your hoodie are both amazing! Perfect sewing as always. Wow! 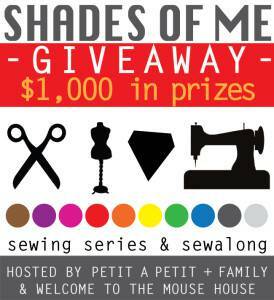 Your sewing is perfect, that shade of green is perfect, those mountais are perfect, the whole pattern is perfect! Can’t wait for the pattern to be released! I love that you put the thumb holes in the cuffs. I always look for that element when I buy running gear. Wow Laura! That hoodie is awesome and I will be honest with you… this is way more up my alley than any dress. I am such a hoodie and sweatshirt type of gal 😉 I love the thumb holes and I may just have to copy you! Thanks for joining us and glad you had a great trip! Wow! I cannot wait for the pattern either. The tall chin on the hood, the pockets, the thumb holes! I must make one of these. Nice work! And it looks great on you too. You do such meticulous, beautiful work, Laura! 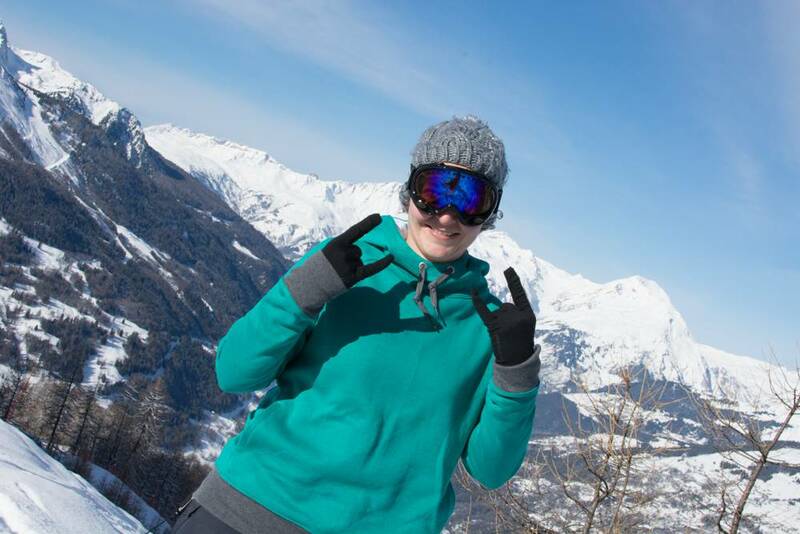 Perfect background for your photos, and you look fabulous in your snowboarding gear!